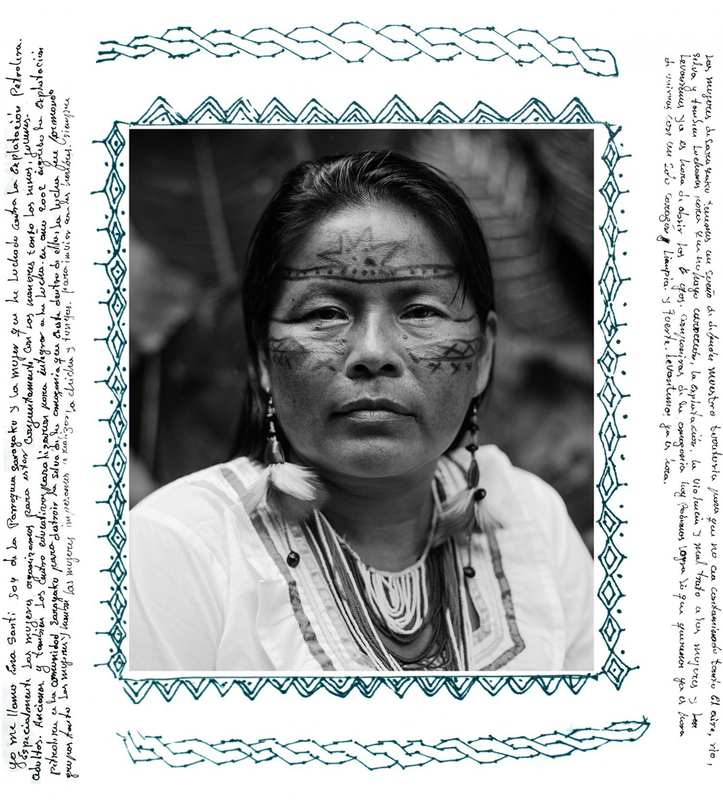 On the front lines of the battle against big oil, meet the INDIGENOUS ECUADORIAN WOMEN FROM THE AMAZON uniting to defend their ancestral territories. 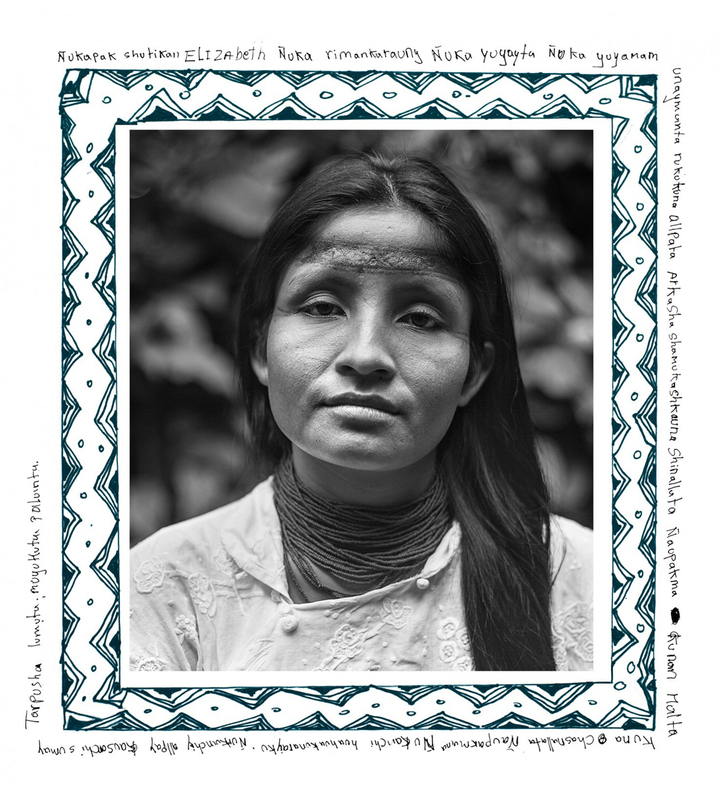 In “Amazon: Guardians of Life”, Ecuadorian photojournalist FELIPE JACOME creates portraits of the women leading the nationwide indigenous rights movement, who are fighting against corporate interests and exploitation on their homelands as the region confronts the impacts of climate change. 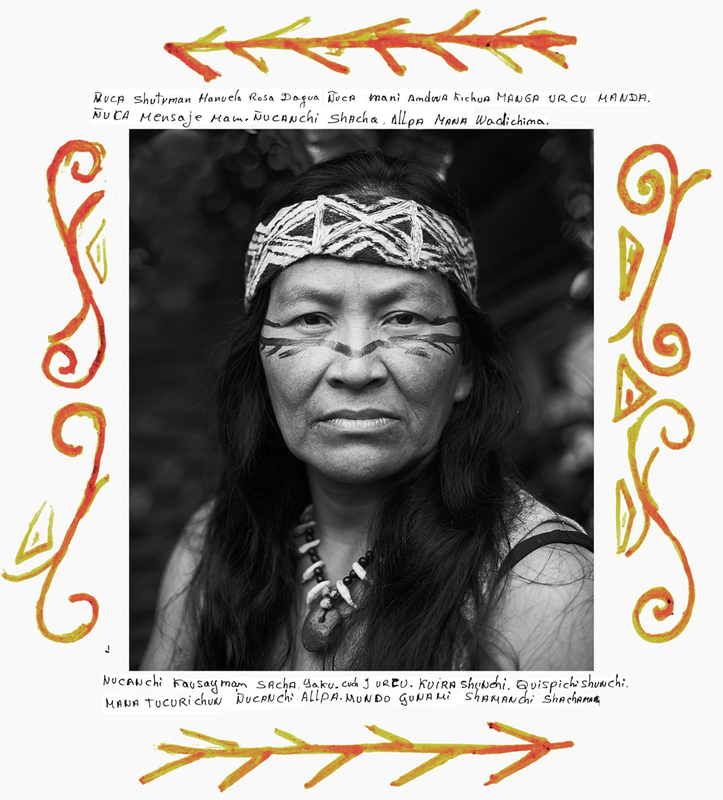 ‘On October 12, 2013, nearly 300 women from 7 different indigenous tribes of the Ecuadorian Amazon embarked on a 219 km march to the country´s capital to ask the central government to spare their ancestral lands from its aggressive oil and mining policies. 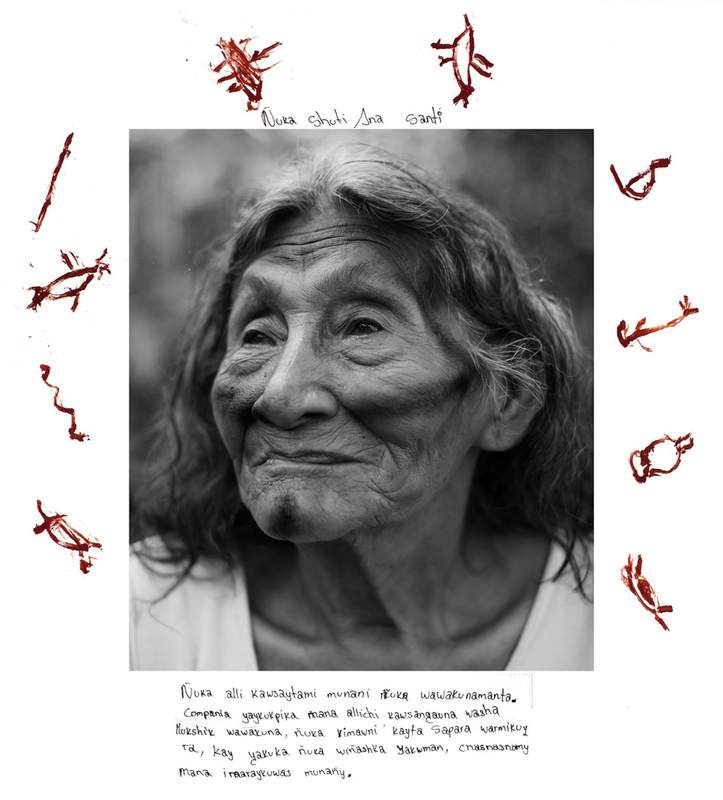 While women have always played an active role in a number of historical marches that punctuated the struggle for indigenous rights in Ecuador, this was the first march that was organized and spearheaded by women. 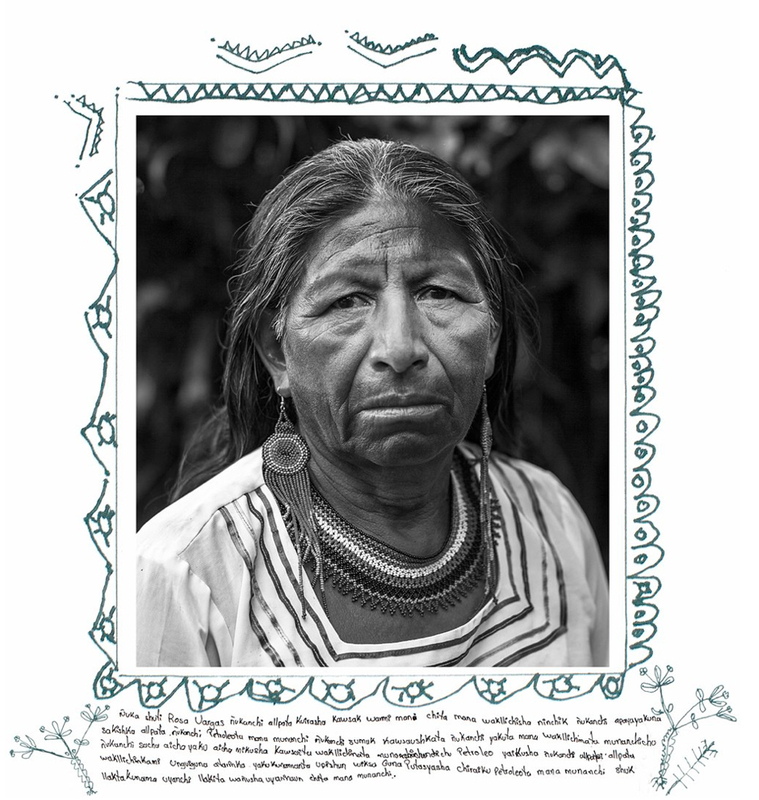 As female givers of life, the women from the Amazon have felt a responsibility to lead the fight against impending oil drilling and the destruction of the pacha mama, or life giving mother earth. Although Ecuadorian public opinion overwhelmingly praised the bravery of the marching women, President Rafael Correa refused to meet with them. 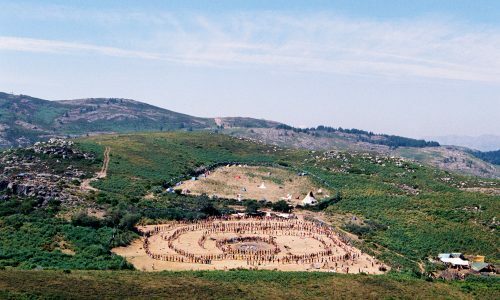 On November of the same year, a smaller delegation of women arrived to Quito to peacefully protest during the 11th Oil Licensing Round, an auction of 6 million acres of indigenous ancestral lands for oil exploitation. The demonstration, however, turned sour when oil executives and politicians came outside and protestors scolded them accusing them of being complicit in ethnocide. Correa took advantage of this situation to publicly portray all indigenous protestors and the NGOs that supported them as violent, subsequently closing Fundación Pacha Mama, one of the most reputed environmental NGOs in the country, and indicting 10 indigenous leaders currently facing charges of terrorism. 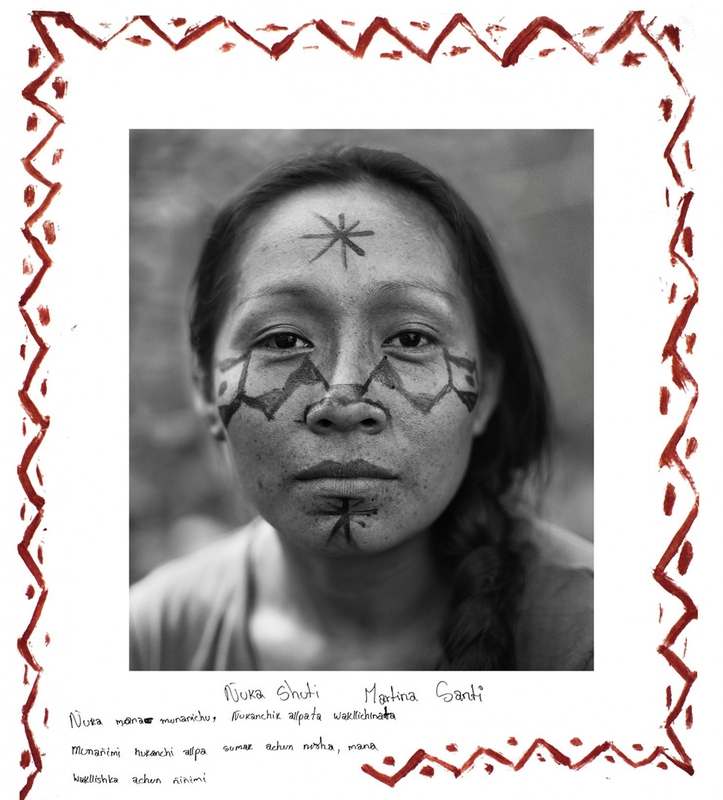 THE THIRD EYE: Tell us about your motivation in creating the project, ‘Amazon: Guardians of Life’. FELIPE JACOME: In Ecuador, there are a lot of young people involved in the environmental movement right now. 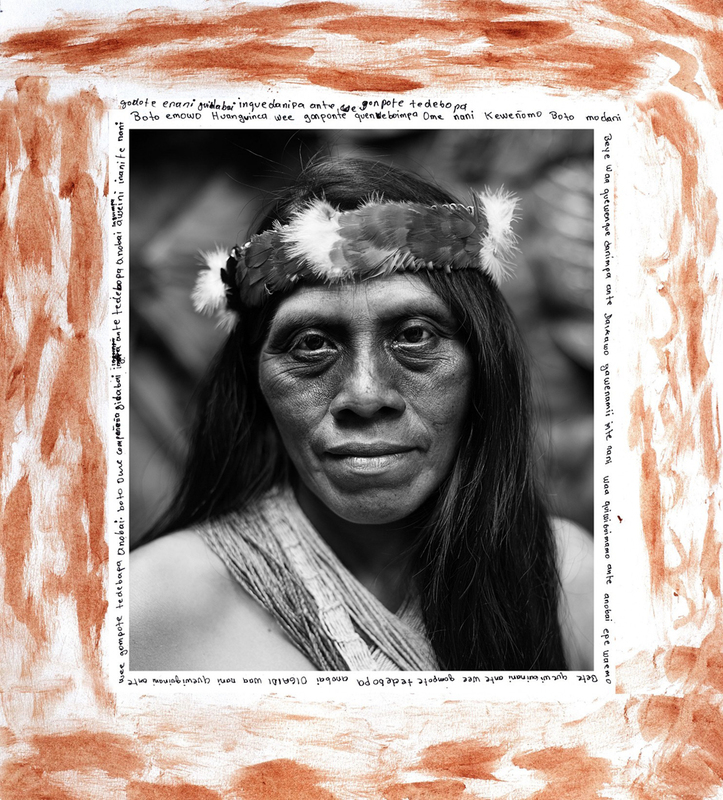 Politically, the most contentious issue is an environmental one: the protection of a national park called the Yasuni, which is the most bio-diverse place on earth. Over seven years ago, the President proposed to protect this national park if the international community would put up some money in exchange for leaving the oil in the ground and the carbon exchange programs and what not. But after seven years, everybody realised that it was a kind of ruse, a political tool of the President and he’d basically said to drill in this place. So I become most interested in the environment when the women that are part of this series marched to Quito in 2013. There is a strong indigenous population that really see themselves tied to the environment. They’ve come a very long way since the early nineties in their movement to demand rights to their ancestral land. So the womens’ march inspired you to start the project. I wasn’t surprised that there was an indigenous march to the capital – what surprised me was that it was a march led by women. I decided to talk to them and to find out, “Why are you speaking?” In short, they said because men are assholes. They were referring to the fact that men are easily bought. The current administration in Ecuador has bought off most of the opposition. The women explained that their leaders, who had been yelling and screaming and marching for two decades, essentially sold everything they’d been fighting for, for very little in return. When you talk about oil and mining, the amount of money given to these indigenous leaders is peanuts compared to the hundreds of thousands of dollars these industries generate. Tell me about your working process. I noticed you call this reportage a “visual testimony”, a process which you had also used in your reportage “Survivors for Survivors” in Haiti, documenting women struggling against sexual violence. As a documentary photographer, you’re always thinking about how to take a photograph one step further or how to make the photograph count. My answer is by doing these workshops and by including the “subjects” into the process. So we do writing workshops, painting workshops and a series of portraits. 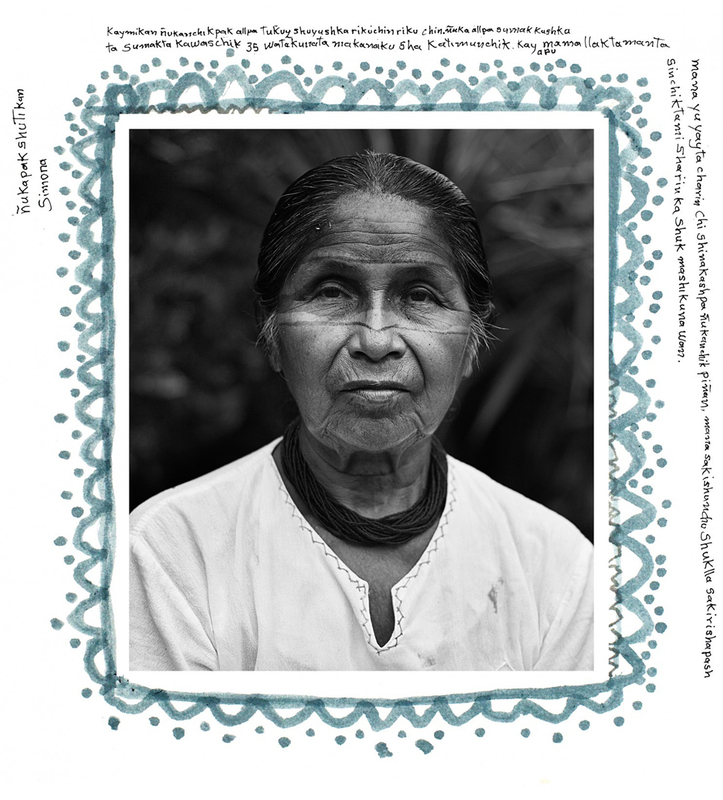 What we did together with these women is no longer just a photograph – it’s a testimony. Even though I work as a photo-journalist, it’s very important for me to have the voices and messages of the people in there. To tell you the truth, once these people are there, the photos are not mine anymore: the photographs are theirs, they’re ours. And that’s a beautiful thing. 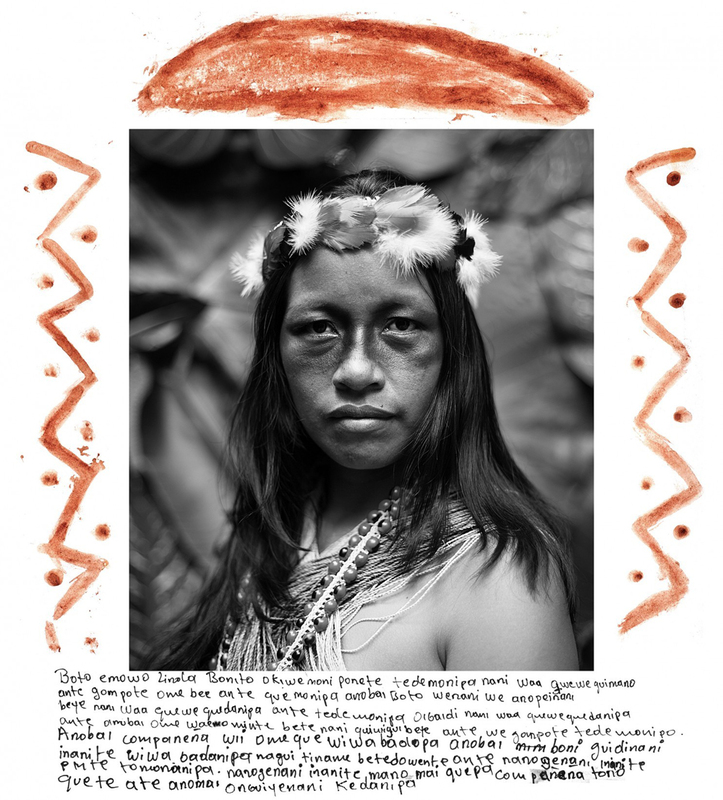 The Amazon women speak about the jungle as their identity. Their life is the jungle. They’re very aware that if they go to the city, who they are is done. The men much less so – with a bit of money, booze, prostitution, they’re more or less happy. But these women know that what they’re defending, it’s who they are. That’s going to be useful for their civilisations, their cultures, for the people. This is a fight they’re willing to give everything to. They’re facing great odds, great adversities, tremendous forces. Just last month, a Shuar indigenous leader [José Isidro Tendetza Antún] was murdered in the Southern Amazon in Ecuador. I knew him. I was very sad to hear about his death. He was actually my guide in documenting the mine in the Ecuadorean rainforest on Shuar territory. 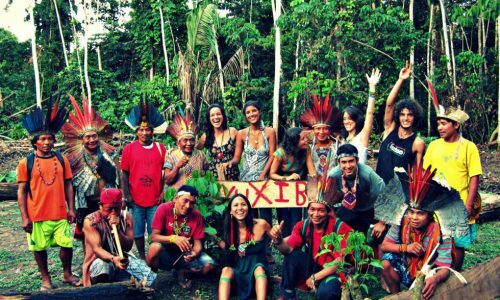 There’s a tremendous amount of persecution against environmental leaders in Ecuador. 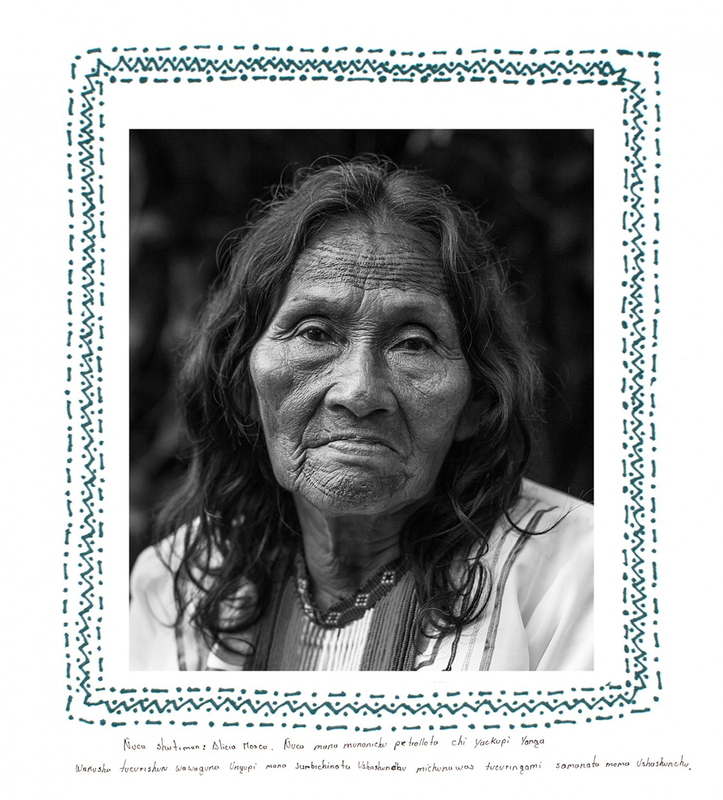 Have the women you photographed been affected by Chevron’s environmental disaster in Ecuador? The ongoing court case has received a lot of attention recently. They have been marked by Chevron but they haven’t been affected by Chevron. The women that I photographed are from the centre and the southern part of the jungle, near the Peruvian border. The northern rainforest and the people there have been completely decimated and destroyed. The Chevron-Texaco oil spill was in the north of Ecuador, where they operated for 40 years. 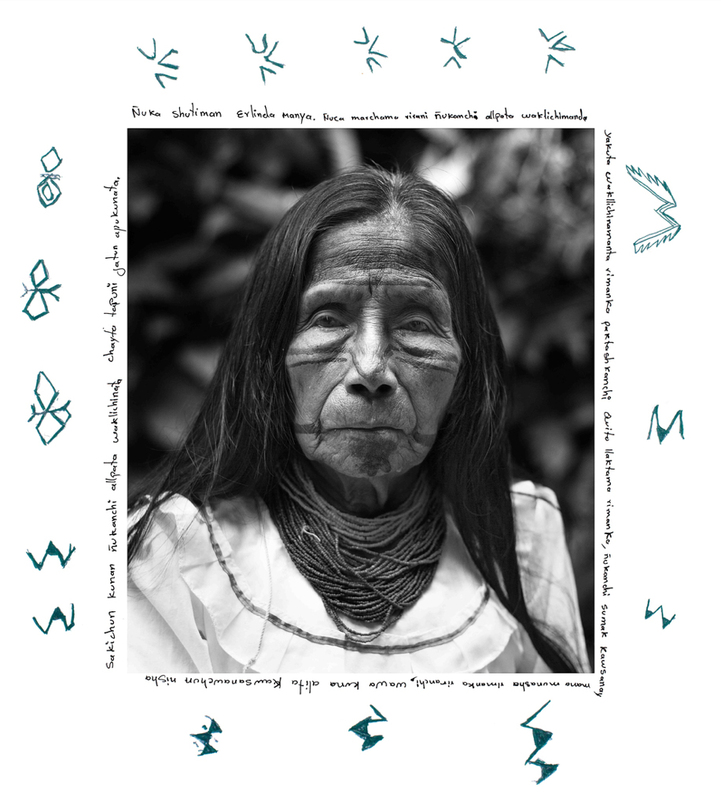 The women I photographed had gone to the north of the Amazon region, and met the indigenous people there. 40 years ago, the people in the north were told “we’re going to exploit the oil, you’re going to get all these benefits!” Sure! Sounds lovely… But 40 years later, the women have seen that their fellow indigenous people in the north are still tremendously impoverished, can no longer survive from the jungle, have crazy rates of cancer and disease… So for them, it’s actually quite clear what’s going to happen. There’s no mystery. Do you plan to extend this series? I would love to do more work on it. I would love to make it into some kind of a small video documentary. 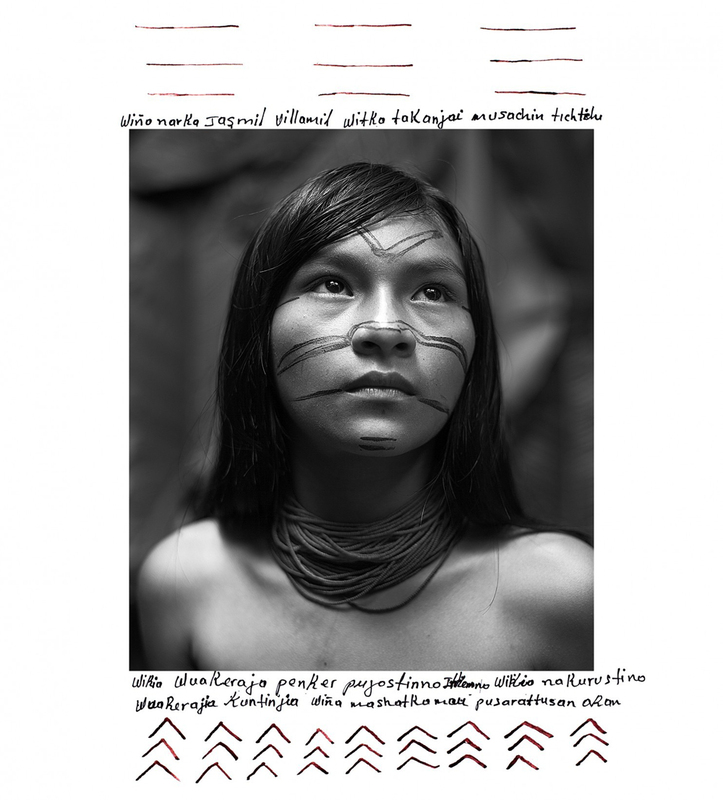 The photographs were exhibited in Lima and at the UN COP20, accompanied by a delegation of the indigenous women photographed. They don’t need permission from me as a photographer. The fact that the women consider those photographs to be theirs, to be actual representations of themselves, is important. 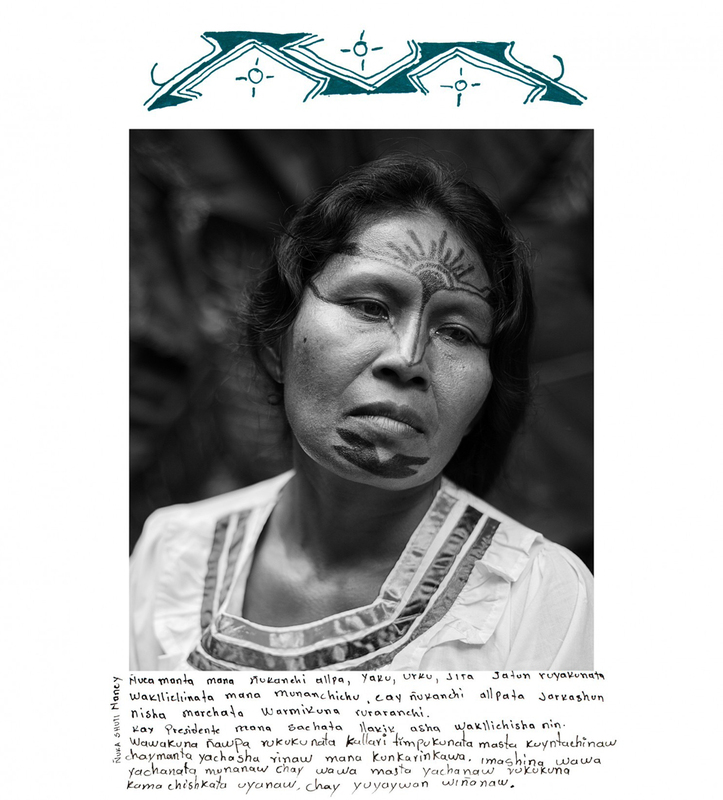 A lot of the time you see photographs that exoticise and folklorise indigenous peoples. “My name is Ena Santi. I’m from the community of Sarayacu. I’m a woman who has fought against oil exploitation. 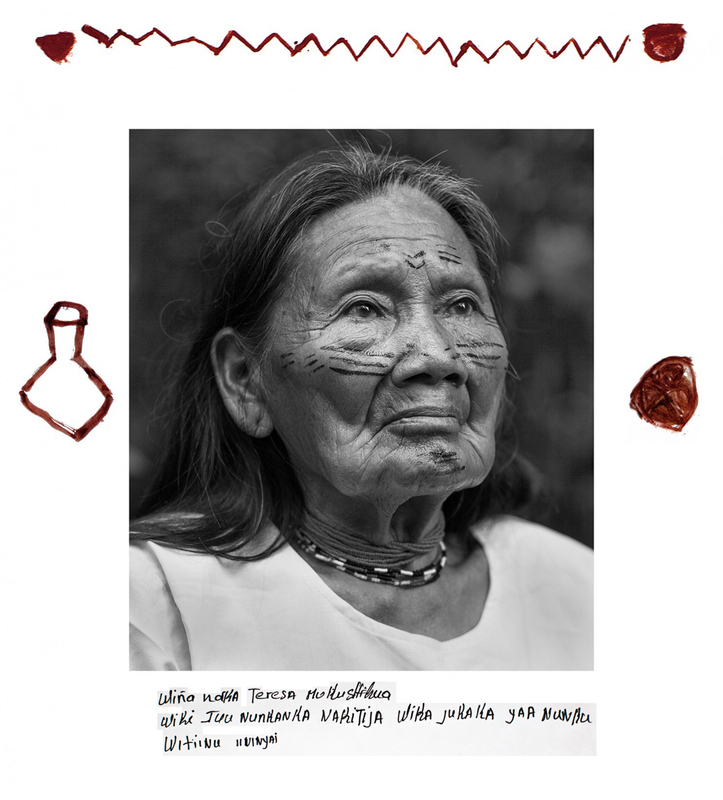 In 2002, an oil company came into Sarayacu territory to destroy the Amazon jungle. The women in this community worked side by side with our children, youth, adults, and elders to resist. Even our schools shut down during our struggle against the oil company. The series has been touring with a delegation of women leaders to spaces from New York City, to the UN COP20 events in Lima, and the exhibition is set to join the 2015 UN COP21 in Paris. The NGO Amazon Watch presented the series at a panel discussion, “Women Leading Solutions on the Frontlines of Climate Change,” organized by The Women’s Earth and Climate Action Network and Acción Ecológica during Climate Week in New York City. 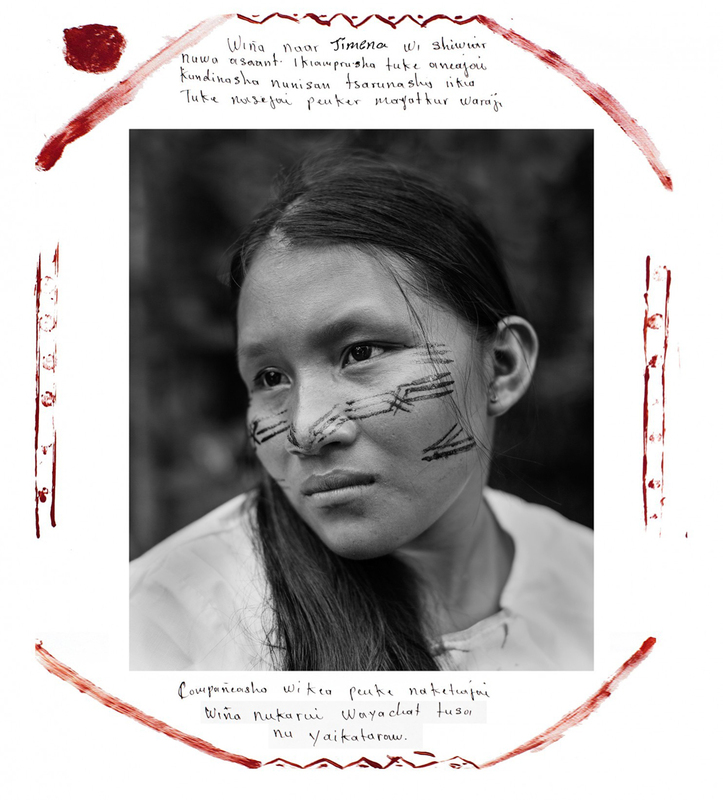 In Ecuador, the images continue to be used to raise money and awareness for the movement to defend the indigenous people and their lands, including at Simón Bolívar University in Quito, as part of an exhibition on the environmental situation in Ecuador.